Prior to Game 1 of the World Series on Tuesday, Major League Baseball commissioner Rob Manfred went on ESPN's Mike & Mike, where he was asked to give his stance on the Cleveland Indians' controversial “Chief Wahoo” logo. The logo, which has been worn in every game throughout the playoffs, has been widely criticized for being insensitive and offensive for its characterization of Native Americans. The team also uses a retro, block-lettered 'C' as a hat logo, but players voted to play with the Chief Wahoo cap in all postseason games. Though the players appear to prefer it, the future of the logo may be bleak. 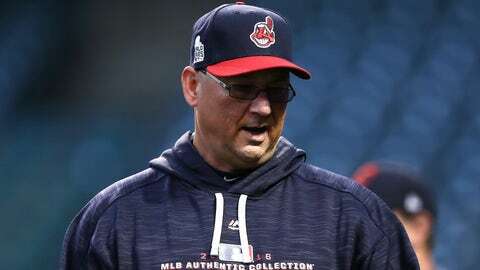 Commissioner Manfred said that he plans to meet with the Indians' ownership group after the season to discuss the logo and what should be done with it down the road. There's been quite a lot of attention given to the logo this offseason, as a protestor in Canada attempted to have the team's name and Chief Wahoo logo banned from Toronto while the Indians were playing the Blue Jays in the ALCS. 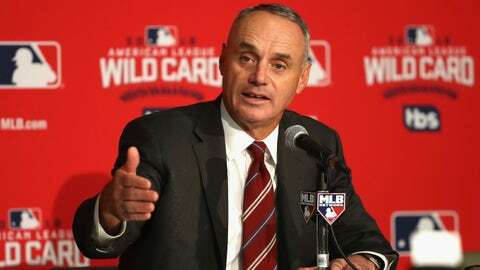 It'll be interesting to hear where the discussion between Manfred and the team goes this winter, but the commissioner says he's hoping for an open dialogue to find a path to resolution. Where that path leads, we'll just have to wait and see.